This month I’ve prepared Volume 2 of a special classics Gabriel & Dresden Tribute CDMIX. It features many of their own productions and remixes, also some of their side projects like Andain. Thanks to the permission by Dave Dresden I’m allowed to make this mix available for everyone! Enjoy! 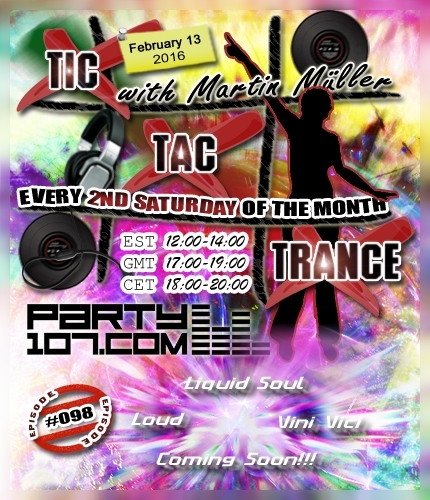 Tic Tac Trance #098 Replay available! Tic Tac Trance #098 is almost here! This episode will air on February 13 2016 on Party107.com and will feature new tunes and remixes by artists like Loud, Vini Vici, Liquid Soul, selected tunes by Coming Soon!! !‘s album The Album and, of course, many, many more! This time I’ve prepared a psychedelic and uplifting 2 hours underground trance journey. Make sure to tune in!